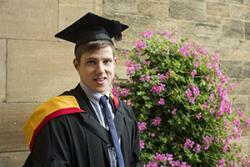 A talented, prize-winning designer graduates from Bangor University this week thanks to the support from his mum. Former Denbigh High School pupil, Jordan Burns, 21, from St Asaph graduated with a BSc Product Design degree and also scooped the Normal Fund Prize. This prize is awarded annually to two students who have gained the highest marks across all undergraduate courses within the School of Education. Sad to be leaving Bangor, Jordan said: “I grew up on a small estate in St Asaph with my mum. She was the one who pushed me to do well and go to university. I was never outstanding in school, but during my A levels I found my talent for product design and decided to pursue it as a career. “I’m so pleased to have won the Normal Fund Prize. It feels great to be recognised, and shows all of my hard work paid off. It inspires me to keep on moving forward and improving within industry. “During my studies I worked with MK Electric helping them to develop a new range of electrical accessories for the home, and worked on the ESO EELT project with OpTIC Technium in St Asaph. I also competed in the University’s Enterprise by Design competition, in which multi-disciplinary teams had to redesign the packaging for Dr Zigs Bubbles. My team won and it was a really rewarding experience. During the competition I learned a lot about the psychology and business aspects of design. In the future, Jordan hopes to be the best he can in his career in design.